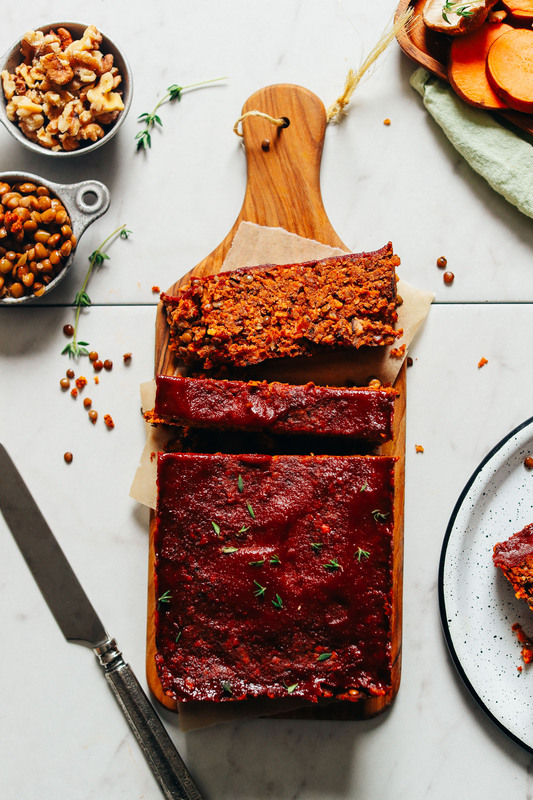 Friends, it’s been a long time coming, but my take on a vegan “meatloaf” is here (just in time for the holidays)! And it’s so very delicious. Let’s do this! This recipe is simple, requiring just 10 ingredients and simple methods. I relied on canned lentils (don’t judge) to save time and dishes! Feel free to do the same and proceed to act like you made everything from scratch (I won’t tell). The base for this loaf is cooked sweet potatoes, mushrooms, lentils, nuts (we went for walnuts and pecans), and fresh thyme. Tomato paste adds moisture and hearty flavor, Worcestershire adds that “umami” effect, and salt and pepper help round everything out. All that’s left is to stir in some gluten-free bread crumbs for texture and transfer to a loaf pan! For a glaze – I know it’s so basic – we just went with ketchup! It’s simple, and it outperformed more elaborate glazes! Who knew? This would make the perfect entrée or side for the holidays! It’s tasty on its own, but it would be elevated if served with our Easy Vegan Gravy and Perfect Mashed Potatoes! Major swoon. If you’re into hearty plant-based entrées, also be sure to check out our Smoky BBQ Black Bean Burgers (which inspired this recipe! ), 1-Pot Golden Curry Lentil Soup, Black Bean Plantain Enchilada Bake, and The Best Vegan Meatballs! 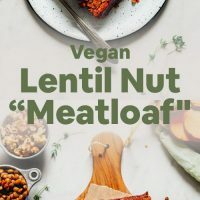 Incredible vegan lentil "meatloaf" with wholesome, whole-food ingredients like lentils, nuts, sweet potato, and mushrooms! Just 10 ingredients required for this flavorful, comforting entrée. Heat the oven to 350 degrees F (176 C) and line a standard loaf pan (or 8x8-inch baking pan) with parchment paper. Set aside. Heat a large cast-iron or metal skillet over medium heat. Once hot, add half the oil and mushrooms. Sauté then cover and cook for 5 minutes, stirring frequently. Once softened and reduced in size, add the vegan Worcestershire and stir to coat. Cook for another 3-4 minutes or until caramelized. Set aside. Meanwhile, heat another large cast-iron or metal skillet (or use the same one as you cooked the mushrooms in) over medium heat. Once hot, add the rest of the oil and arrange sweet potatoes in as even of a layer as possible. Then cover and cook for 4 minutes. Flip, add 3 Tbsp (45 ml) water, and cover. Cook for another 3-4 minutes or until tender and browned (but not mushy). Set aside uncovered to cool slightly. 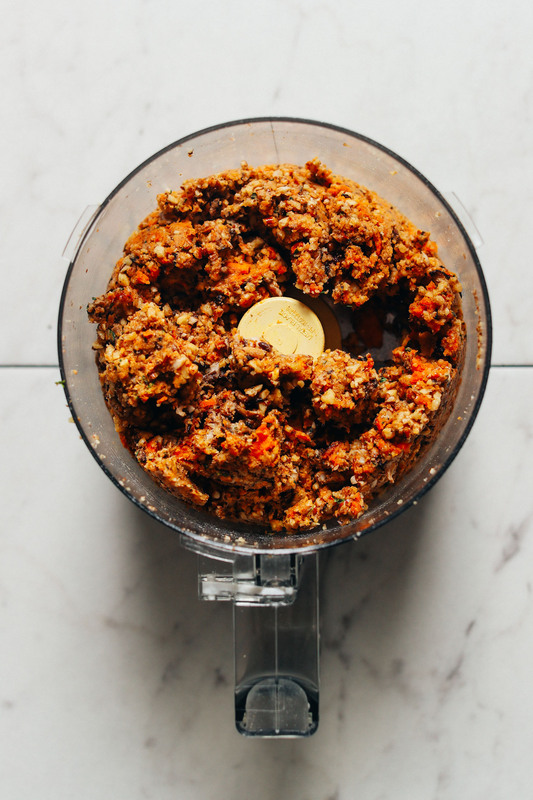 To a large (at least 7-cup) food processor, add nuts and pulse a few times into a loose meal. Then add sweet potatoes, mushrooms, and thyme, and pulse to combine. Add lentils, salt, and pepper and pulse to loosely combine but be careful not to purée. Transfer mixture to a large mixing bowl and add tomato paste and Worcestershire and stir until a loose dough forms. Then add bread crumbs (we like Ian's gluten-free panko) a little at a time (we used all of the recommended amount) until a thick dough forms. If for some reason it’s crumbly (which may happen depending on the texture of your lentils), scoop half of the mixture back into the food processor and pulse until it’s more finely puréed and then return back to the bowl and stir with the remaining mixture. If for some reason it’s too wet, add more bread crumbs as needed. Taste and adjust flavor as needed, adding more tomato paste for added moisture / tomato flavor, Worcestershire for depth of flavor, salt for saltiness, or thyme to taste. Transfer the mixture to the parchment-lined loaf pan, spread, and press into an even layer. Then add ketchup glaze (optional) and spread into an even layer. If not using the glaze, brush the top with a little oil to help the loaf retain moisture. Bake uncovered for 35-40 minutes or until golden brown on the edges and slightly dry to the touch. Remove from oven and let rest for 10-15 minutes in the pan. Then gently remove and carefully slice and serve. Leftovers keep for 4-5 days in the refrigerator or 1 month in the freezer. Reheat in the microwave or in a 350-F (176 C) oven until warmed through. *Nutrition information is a rough estimate calculated with avocado oil and Worcestershire and without optional ingredients. Has anyone made this ahead of time and refrigerated overnight and baked the next day. If no one has, do you think doing so would jeopardize the meatloaf’s outcome after baking? It looks like one reader has done so with success and we think that should work well. Hope that helps! If you give it a try, we would love to hear how it goes. Thanks for catching this, Sharon! We mention to “ensure vegan and gluten-free friendly as needed,” but it looks like we missed one of the mentions. It has been updated. Thanks again! Hi, I’ve just made this vegan lentil loaf tonight! So, full disclosure, I’ve never made meatloaf in my life, so this was a totally new experience. I am a huge fan of this recipe though! Though I processed them, the walnuts add a nice gentle crunch that I really like. I only have a mini food-processor, so I ended up processing each ingredient separately and then mixed them together in a bowl until it turned into a dough. As in the instructions I tasted and added seasonings, which included more of all the seasonings, but I’d be more careful with the worcestershire sauce next time– I overdid it. I was très lazy with the sweet potatoes and cut them into smaller pieces to cook and process faster– turned out fine. Because I like really well cooked mushrooms, I would sauté more next time along with sliced onion and minced garlic. 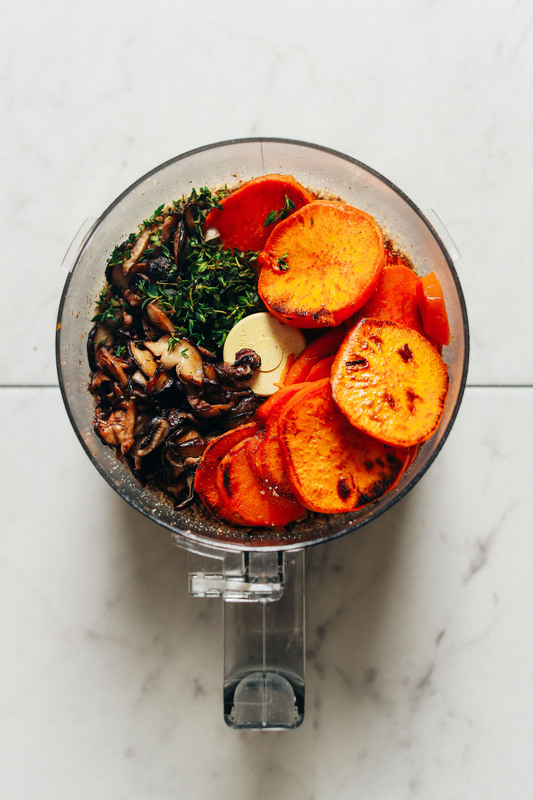 Now that I know the process, I would also try experimenting with more vegetables, like shredded carrots, or whatever happens to be in my fridge. For the glaze, I added a little water to the remaining little tomato paste can and stirred it together with what was left and smeared it on top, it was just enough to cover the top with a thin layer. I then topped it with a very scant amount of brown sugar. Love it! This is a new food I will be adding to the regular rotation. I forgot to add that I also used wheat germ, my go-to instead of bread crumbs. So glad to hear you enjoyed this, Jocelyn! Thanks for the lovely review and suggestions! Dana, thank you so much for posting all of your recipes for us. Your excellent meal ideas and combinations have expanded my pallet and made being a Gluten free, dairy free Vegetarian a joy. Again, Thank You! Okay, so I totally used this recipe more as a guideline than specific instructions, but it turned out AMAZING. I used all walnuts, subbed some leftover mushroom/lentil/kale soup for the mushroom portion, overly mushy overcooked lentils, and I added what was left in the bottom of a bag of gardein beefless crumble (about 1/2c), and I used some chickpea “bread crumbs” I had left over from another recipe… then baked them in a muffin tin, to make individual portions. Holy baloney. It seriously tastes just like meatloaf like gramma used to make. Good call on the seasonings. The thyme, tomato paste, & worcestershire made it a super meaty/umamibomb. Super delicious. I did not have mushrooms and substituted a red onion and an apple. It was DELICIOUS and is a new staple in our house. Our picky kid loves it too. We turned leftovers into taco and sloppy joe filling with lots of fixings. Yum & thank you! Made this and it was delicious!!! I am not the best cook and accidentally left out the breadcrumbs. Didn’t miss them at all. I could not wait for leftovers lunch today and then had it for dinner again because it’s that good. I have been gluten free for many years and have just made the leap to becoming vegan. I was extremely weary of finding foods that I could eat, that wouldn’t lack flavor. After some research I came across this recipe and I’m so glad that this was my first vegan gluten free meal. It was absolutely delicious and was full of flavor. I’m glad that I made the lentils because the consistency was perfect. Made myself a sandwich the next day with it and it was amazing. I am staying on the path! Thank you !!!! So glad you enjoyed this recipe, Isabelle! Thanks for sharing! Help! I made this last night with tempeh instead of mushrooms (my boyfriend is allergic) and it was just okay. I’ve never had a MB recipe I didn’t love so I’m SURE it was the substitution. Any suggestions as to what I could use instead of tempeh for a better substitute? I also added onions for the caramelized flavor and garlic because we are huge garlic people. I have a few ideas of how to make it more flavorful with tempeh, but I’d love a better substitute! Thanks for the help! Hi Kaitlyn, sorry it didn’t work out for you with subbing the mushrooms for tempeh. We aren’t sure of a substitute for the mushrooms as they are a pretty key flavor. Our only idea would be to try increasing the worcestershire or thyme for more flavor. No worries! It definitely wasn’t bad, just didn’t blow me away like every other MB recipe. ;) I’ll definitely make it again and keep playing with the flavors to see what I can come up with. I followed the recipe exactly, using a loaf pan as it explains. But it was so wet inside and it would not hold together. The texture was so unappealing and moist. Disappointed because this was a lot of work with all the separate cooking and steps. Made this tonight and it was delicious! I added raw onions and crushed garlic to the mix. Would definitely recommend! Whoop! We’re glad to hear that, Ashley! This recipe was so good!!! I loved how accessible all the ingredients were – most of them I already had in my kitchen, which is always a huge plus. I used red lentils because that’s what I already had in my pantry. Not sure if that makes a huge difference, but man did it taste good so I’d totally recommend that. I added some red pepper flakes and cumin to the mix before putting it in the pan. That’s one of the best parts about this recipe – very accepting of almost any spice to jazz it up a bit! Thank you Minimalist Baker team!! Will be making this again! Made this tonight and it was delicious. I just added a bit of carrots because I didn’t have enough mushrooms. Mine came out a bit mushy. Any suggestions? More bread crumbs will do the trick. Glad you enjoyed it! Hi I am not vegetarian but eat many plant based meals. When I make “real” meatloaf I use oatmeal instead of breadcrumbs (I never have those around and have cut back on bread). Would oatmeal work? Or chickpea flour? 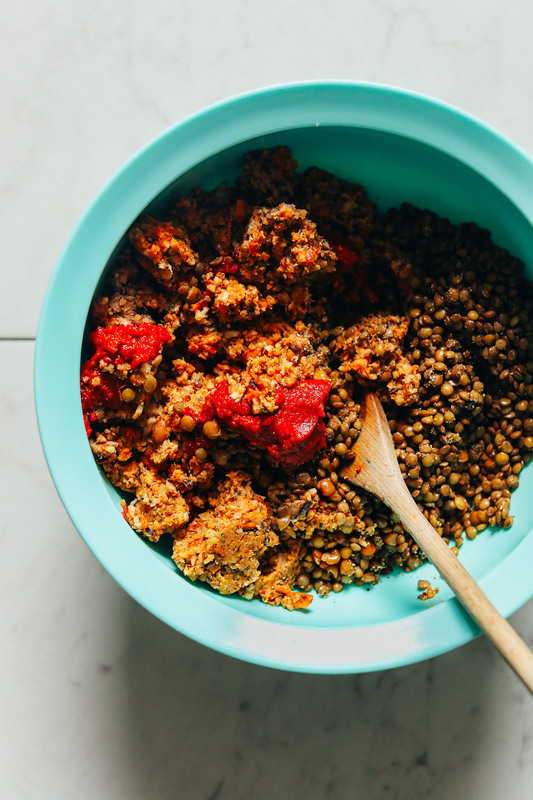 I love lentils so I am excited to try this recipe. Oatmeal should work, though we haven’t tried it ourselves in this recipe! Let us know how you make out. What kind of oatmeal would you use? I have steel cut. Could I make this without a food processor? I don’t really understand how people measure rigid objects like sliced sweet potato rounds by cups. It seems like the amount of empty space in a cup would be completely dependent on the shape of your measuring glass/cup and the width of the potato, plus some random chance. I’d feel more confident that I could pull off a recipe like this if the weights were listed. Wow! This was soooo good! Didn’t make any changes and everyone loved it. I made your vegan mushroom gravy along with it and mashed potatoes and turnip and it was the best meal I’ve had in a while. My mom asked for the recipe. Definitely will be making it often. Thanks for all your wonderful recipes!! Added this recipe to my regular rotation! Perfect for weekday work lunch. Didn’t change a thing and it was 💯. Yay! We’re glad to hear it! I made this tonight! However the consistency was awesome but all we could taste was walnuts like sooo many walnuts! I am not sure what I did wrong but we unfortunately couldn’t eat it. This was DELICIOUS! I have tried many vegan loafs and not only was this the easiest one to make but it is by far our favorite. For any people complaining about the mushrooms- I chopped ours up smaller before sauteeing because my husband doesn’t love mushrooms. Once processed they were broken down and my hubby had zero clue it contained mushrooms, just raved and raved about it. It was good the night of and possibly even better the day after as leftovers! Hi Dana, I’m a big fan of your site and recipes! I just made this, but I realized too late that I didn’t have any breadcrumbs so I’m hoping once I take it out of the oven it will be okay without them. It smells delicious, but I have to admit–this recipe was way more work than one hour for me. In order to sauté two cups of sweet potatoes at a time, I had to use my large cast iron skillet. However, I could only fit about half in at a time, forcing me to cook them in two separate batches which added time on. Also, I didn’t realize about the lentils having to be pre-cooked, so that added another 30 minutes for me. In total, it’s about two hours of prep and cook time for me! I forgot to add–the food processor also slowed things down. I have a large one, but I found that the walnuts made everything stick together so I had to really work at it for a while. It probably will taste amazing, but it was not an easy recipe to make. I had been craving Thanksgiving dinner ever since my family’s lackluster Thanksgiving last year, so I decided that it was time to stop feeling sorry for myself and make a lentil loaf. I’ve always been a big fan of this site, and although it did take me quite a bit longer than 30 minutes, it was well worth the effort. I have difficulty with nuts sometimes so I decided to sub sunflower seeds, and I swapped tamari for the worcestershire sauce. Normally I would have ketchup’d it up because — delicious! — but since I was going for Thanksgiving I decided to leave it bare and slather it in gravy. I made the vegan mushroom gravy from the site as well, and although I added a little too much rosemary, it was still delicious. Oh, and it looks good on a plate, so this would definitely be “company-worthy.” I might even make this and take it to my family’s in November. Would definitely recommend it! I made this! It was delish and I am still eating it this week for lunches. Really easy recipe to follow and delicious even for non vegans. My husband really enjoyed it even though he is not plant based. Keep the yummy recipes coming! Thanks! Made this over the weekend. Delicious, although it needs a little more zip. I tried ancho chili powder and that helped. Next time, more spices, too. For those looking for an alternative for the breadcrumbs, I used garbanzo-bean crumbs, which are vegan and non-grain. I am going to try ground-up rice crackers some time, too. Definitely will make again. While it tasted delicious, I don’t think I got the texture quite right. Even after letting it stand, as directed, it was still a little mushy. I will try more breadcrumbs and a little less pulsing in the food processor next time. This “meatloaf” is by far the best vegan dish Ive made!! Already planning on making it again. Thank you so much for sharing this. 1. Texture: this was a mushy mess. Really hard to eat. I followed the recipe to the word. After watching the video I added breadcrumbs until the consistency matched. Having made meatloaf often as an Omni, I new what I was going for. I was really disappointed. The flavor is so good, so it’s disappointing that it was so hard to eat. I’m gonna plan around with it a bit and see what I can come up with! 2. Very difficult to make. This is definitely time consuming. Between all of the slicing, sautéing, processing, and reading I could barely keep up. Definitely not an easy recipe. Flavor is just SUPERB. Delicious, hearty, and comforting. Texture and difficulty is my only issue! My friend and I made this with the cauliflower mashed potatoes, and let me just tell you it was positively amazing. Literally so good and definitely one of our favorite MB recipes that we’ve tried (and we’ve tried A LOT okay). AMAZING MUST TRY! After reading about the texture, I decided to add 1/4 cup flax meal. Although this was a tasty recipe, it still came out more like mushy paste. 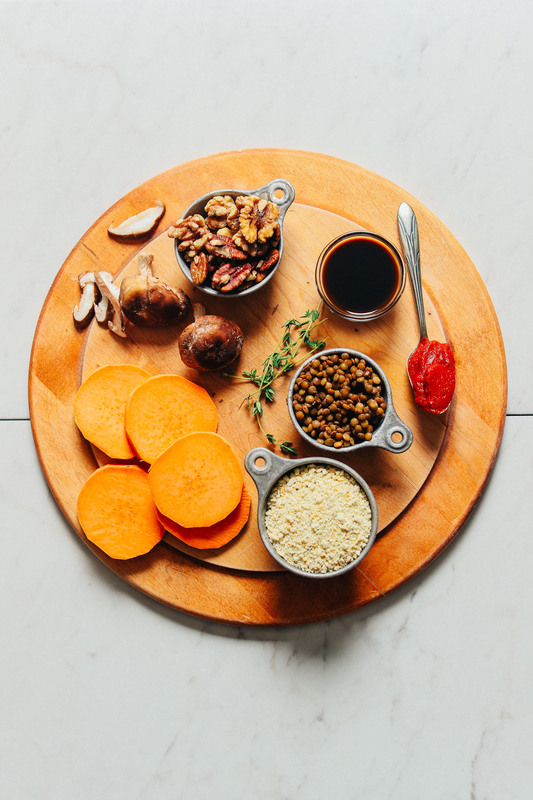 I think if I tried it again I would not mix it in the food processor (except the nuts), I would mash the sweet potato only slightly by hand, I would used canned lentils instead of just made. Great recipe! I made a few changes – added flax seed to the nut mix and ground it in lieu of breadcrumbs as a binder, added Herbs d Province, a large onion and celery to the mushroom mixture, added some hotsauce for a little kick and blended only half of the total mix cause I like it chunky and kept the potatoes as a topper, like sheppards pie. Wonderful! Thank you! We had a friend bring this to our Christmas dinner. I’m not vegetarian and wasn’t expecting much. It was delicious!!! It didn’t have the texture or taste of meatloaf but it was fantastic and I intend to regularly make it myself. It was sweet and savory, and a nice flavor. Our friend said she followed the recipe and that it was very easy to make. I had the opposite problem as most commenters. The loaf turned out too dry for me and I attribute that to 1 cup too few mushrooms and I made the mistake of cooking 2 cups of dry lentils instead of 1. Perhaps adding extra lentils will make your loaf less mushy. I made this and thought it was a great vegan nut loaf for texture and consistency but found the thyme flavour quite overpowering, is there some other herbs/spices/flavourings you would suggest to compliment and tone down the thyme? Thank you, love your recipes they’re great! My parents live in the middle of nowhere and I planned to make this but could only find red lentils at the grocery store. Do you think they’d work or will they be too soggy and fall apart? Sorry for messaging xmas eve! Hi Kaley! Red lentils might work, though we haven’t tried and can’t guarantee it. Report back if you experiment with it! Would this mix be good as a “meatball” recipe? Yes! We have a meatball recipe inspired by this one actually, which you can find here! Hi! I was curious – when you say the frozen shelf life is up to 1 month, should it already be cooked or would you recommend freezing the uncooked mixture and then bake the day-of use? My husband and I wouldn’t eat this whole thing and wanted to try freezing half for later – the rest is already in the oven and smells amazing! I’ll report back with what I’m sure, is a 5 star rating like everything else you do. ;-) Thank you! I made this for a vegan family member and it looks and tastes great. I am gluten free tho not vegan, so I used coconut flour instead of breadcrumbs. It’s very absorbent so just start with a little at a time and mix thoroughly, till it’s right. What would be a good sub for mushrooms, I’m allergic to them but really want to make this lentil loaf. My family is in love with this recipe! I left out the mushrooms and brushed the “meatloaf” with oil before I topped it with ketchup to keep it from drying out in the oven. I will be adding this to my regular rotation. I even doubled it and made two when family came in from out of town! So far everyone who has tried this is in LOVE!!! Would love to try this but I want a firmer loaf to cut cold for sandwiches. Would flax eggs help to firm it up? Suggestions? It might, though we haven’t tried it ourselves! I made this and, like others, loved the taste but the consistency was mushy … my fix was to cut out a portion and let the filling crisp up in the toaster oven. My biggest disappoint with this recipe was the price. Raw nuts especially are so expensive, as are a lot of ingredients that you use (as I search around for extra holiday recipes to make). I am very glad for your success. I have been cooking off of your blog since its first year, and you deserve every bit of it. I do miss the old days though — when you seemed tightly fixed on creating simple, healthy recipes that anyone could afford, make on a busy schedule, and with easy to find ingredients. I loved also when you’d occasionally throw in general tips about how to cut down on one’s overall budget and keep things simple. Now the “minimalist” angle feels more like attaching yourself to an aesthetic trend more than any real priority. Dianna, I so appreciate the recipe feedback as well as your thoughtful insights on our blog. It’s always wonderful to hear how people found us and why they’re attracted to our content. The site has admittedly evolved a lot over the years, which is a good thing overall. But this is a great reminder to always come back to the real heart of what we do: simplicity. Thanks again for your feedback! Thanks for the reply, Dana, and all the work you do. I wrung my hands about whether or not to write anything because I know you’re a real person with feelings (that I most certainly don’t want to hurt). Thank you for the kind response, and for helping people like me think more closely about both how much I should spend on food while staying healthy, as well as how many pair of jeans I actually need in my closest. :) As we say in South Africa, you are TOTALLY lekker. Thought I might mention – I get all my nuts on Ebay. So many of the nuts in the U.S. are pasteurized and that renders them useless as far as nutrition goes. Many of the nuts sold on Ebay come from Europe, especially Turkey and Malaysia and I’ve always been exceedingly happy with the quality. I always find some really good deals price wise there. You can save money by buying them as “pieces” instead of whole – all my recipes are vegan so I do not need them as whole anyway and I delightfully found that cashew pieces do not need to be soaked if you use a good blender like the Vita-Mix. I think the time here should probably be adjusted. If the loaf is cooking for 45 minutes, then cooling for 15, then the prep time (which looks like a lot of work) isn’t accounted for in the total time of 1 hour here. Either way, looking forward to making this with some extra time on weekend! Hi! Do you think cashews would be a good sub for the walnuts? Yes, I made mine with cashews and it was amazing! I used cashews as well! My family likes it better than the walnuts. It tastes a bit more creamy and is VERY filling! Can I use a Blender instead of a food processor for this recipe? i forgot to put the breadcrumbs in 😂 will the meatloaf still set/firm up? It will be more crumbly but will still taste good! I made it with a combo of dried and canned mushrooms. Flavor was lovely. It was “soft” but it’s not meat so I didnt expect it to hold up like it. I’ve made a variety of “meatloaf” recipies and by far this has the healthiest ingredients. I make another from a vegan cookbook I have but it has tvp which I know is hard to digest so it supposedly makes people gassy lol but show me a vegan who isnt gassy! Anyway, love you, definitely will make again. I read all the comments and I was wondering if you could use canned mushrooms? I have canned or dried right now. I saw replies about dried. Also a lot of people commented about substituting for not liking something, but once it’s all blended I doubt you’d be able to tell what’s in it. Hopefully making tonight. Thanks in advance! Will rate after I make it. 1. I was lazy; I didn’t peel the potatoes, and it was totally fine. I also just cubed the potatoes too, and that was fine too. 2. I found that if I didn’t blend up the potatoes completely, I had chunks of potatoes; I was totally fine with that. I kind of liked the chunks of potatoes in my meatloaf. 3. I added some sriracha to my ketchup glaze. I found it yummy and it provided a little zip to the glaze. 4. OK, I’m REALLY lazy; I didn’t use parchment paper for the second batch, and everything worked out fine. I simply sprayed the baking dish with coconut spray oil. I’m thinking of using this ‘base’ in a shepard’s pie. I simply LOVE the recipe and it’s usefulness. Thanks so much for the wonderful blog/recipes. I can’t stop posting. One more thing I did that was odd….I ran out of bread crumbs so I searched the kitchen for any alternative could find. This is going to sound VERY weird…but…I used some Trader Joe’s O’s….that’s right….cereal……(unsweetened)….and it turned out totally perfect. I was wondering if my husband would be able to tell……he didn’t. Surprising what you’ll find in the kitchen in a pinch. I made this and it turned out mushy. Probably my fault. However, I was able to slice it and make it into “patties” that I put on a baking sheet and back in the oven. They had good flavor, and not all was lost. Thought I’d throw this out there for anyone else who ends up with a mushy loaf like me. First off, I loved almost all the dishes on this blog that I’ve tried. That being said, this one was a dud for me. Between sauteing, processing, and mixing, there was way too much work, compared to the usual minimalist fair. The end result just didn’t hit the spot at all. Maybe too mushy, or too nutty? I’m not sure, but I will not be making it again. I’ve never tried real meatloaf, though, maybe it’s just not a food for my taste buds. So good! I think I may have gone a bit overboard with pureeing, but it was still delicious! I made this last yesterday and it was a Big hit with my family!!! My mom and my brother loved it!! We all agree it tasted better than the meat version!!! I want to say you are a genius… I have tried your other recipes and they are all winners!! I want to thank you for making it easy for me to include more whole food and plant-based meals in my diet easy and delicious!!! We are sorry to hear that, Erin! Did you get a chance to watch the video to see what the texture should look like before baking? It should be like a veggie burger consistency before adding to the loaf pan. If it’s not, add more bread crumbs. And you can always bake longer if the inside isn’t cooked through. Hope that helps! I wanted to test this recipe to see if it would be a good main course for Christmas dinner so we made it this weekend and it was amazing! It is definitely going to be our Christmas dinner meal. One thing I would do differently is to use dry lentils instead of pre-cooking them because it was a little too soft. But besides that my whole family loved it. Great! Thanks for sharing, Amanda! I made this Saturday night for Sunday lunch as a friend with intolerances and allergies was visiting us. I did everything as it said except the mushrooms as I found woodland mushrooms only. It was fabulous! Everyone loved it. I heat it up in the oven before lunch as the recipe says and it was nice. Looks amazing – do you know how well it works to make the loaf ahead of time and then cook it the next day or 2 days later? I made this yesterday for eating today, to let the flavors meld. 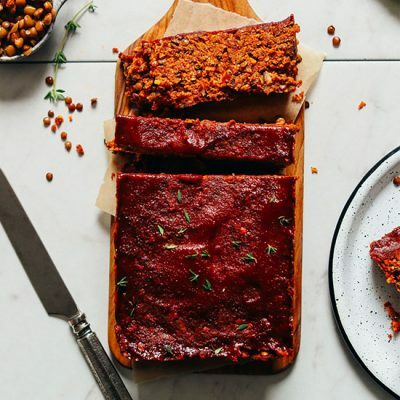 It really is the best vegan meatloaf I’ve ever made, and I’ve made a few. Before serving, I tried some cold on a piece of bread and it was delicious. I can see this sliced thinly on crackers… almost like a pate. So good. Served the loaf slices warmed for lunch with your mushroom gravy, steamed golden potatoes and broccoli. My first thanksgiving alone but that didn’t mean I didnt feast Vegan style. This recipe is so delicious and satisfying. Different from other Lentil loaves I made with the addition of one of my fave vegetables, Sweet Potatoes. I used dried Shiitake mushrooms I had on hand and they really intensified the savory umami taste. Also added a teaspoon of truffle oil. I packed my loaf pan the night before and had extra to make a patty with. Put it in a skillet with some ketchup and a fancy local tomato chili jam. I’ll be doing that again, it was Extra! Thank you, I enjoy following you Instagram feed. We have some severe nut allergies in the family. What can I substitute for nuts? I think that should work! It will likely affect the texture, so just adjust as needed! I used dried shitakes and a combo of pecans and sunflower seeds (that’s what I had). Turned out great! The only obstacle was chopping up the rehydrated mushrooms really tiny so they would actually blend in the food processor. Made it in tiny muffin pan. Delicious! Awesome! Thanks for sharing, Hadass! I made this for Thanksgiving and it was delicious! The only modification I made to the recipe was that I added some garlic and shallots (sautéed them with the mushrooms). And instead of doing the ketchup glaze, I served it with the Minimalist Baker’s mushroom gravy from the cauliflower mashed potatoes recipe (which I also made and loved!). Thanks for making my vegan Thanksgiving a success!! Whoop! So glad you enjoyed it. xo! Dana this Lentil loaf was the star ⭐️ of the vegan Thanksgiving Dinner tonight. I made it a day ahead and reheated in oven. I used both Cremini & shiitake mushrooms, yams instead of sweet potatoes and cooked the lentils in a veggie stock. At first I was not going to use the catsup glaze, but I’m glad I did. It added moisture to every bite. Thank you for this recipe! Yay! Thanks for sharing, Lauren. So glad you enjoyed it. As a favor – next time would you mind leaving a rating with your review?! It’s super helpful for us and other readers. xo! Leftovers of this loaf were so yummy as well. I just squeezed a little more organic catsup on my plate to dip in. Thanks again Dana. I will definitely make this again. So, we made it, so good. Next time will add celery, and carrots (for texture) and LOTS more salt, pepper, tomato paste, Worcestershire, and maybe even a Serrano! Very good though, just needs a boost of flavor! Thank you so much for all the wonderful Thanksgiving recipes! This meatloaf and the vegan pumpkin pie were a big hit today! I made this for Thanksgiving today. I did not top it with ketchup, instead I opted to make the vegan gravy. OMG over the top delicious and satisfying. My carnivore hubby wanted to try some and gave it 2 thumbs up. I will be making this again! Thank you for these great recipes! Yay! Thanks for sharing, Joyce. So glad you enjoyed it! Next time would you mind leaving a rating with your review?! It’s super helpful for us and other readers. xo! I doubled this recipe and it is a good vegan base recipie. However it needs tons more spices including onions garlic much more thyme much more worstechire and soy sauce and I added fresh cilantro, paprika, liquid smoke and roasted garlic as well. Comes out a little mushy even with more bread crumbs so I cooked it in a wider round cake pan for more surface area to hit the heat. I made this for thanksgiving and it is absolutely delicious! I used a sweet potato that was already baked, instead of doing the thin slices in a pan, and it still worked! I made this for my Friendsgiving party and it was a hit among everyone, regardless of their meat preferences! I added some sriracha and garlic bbq sauce as the glaze (since I am not too fond of ketchup) and it definitely added a nice smokey kick to the dish. I made this! I used your recipe for the base, but I’m an Italian from the east coast and our meatloaf is a little different! I tried to recreate my grandmothers meat loaf the best I could. In my adaptation I swapped out the sweet potatoes for russet and I also added 2 cloves of garlic and about a quarter cup of diced sautéed onion. I followed your recipe as directed, but for spices I added a mixture of oregano, basil, and an Italian spice blend (to taste) with some garlic powder to taste as well. I also added my homemade marinara to the “meat” dough as well, but I think it made it a little too wet! I also spiced up my bread crumbs with an Italian blend of spices. For the glaze, I used marinara instead of ketchup. In retrospect I may have made it a bit too mealy/wet so I’m going to test it again but OH my gosh the flavor and this recipe blend of mushrooms and potatoes and lentils is right on!! I made it, with the main modification I added chopped onions that sautteed first. My old meatloaf recepies always had onions. I used less mushrooms simply because I had less on hand, added a few left over peas and carrots, and I used extra butternut squash, sweet potato and pumpkin puree from making ravioli to replace the roasted sweet potatoes. Last modification I made was I used a vegetarian dry burger mix from harmony valley foods instead of bread crumbs. I take the stuff camping it’s pretty great 100x better than frozen veggies burgers. Anyway the lentil loaf turned out awesome. I highly recommend adding onions to the recepie I think it adds a lot. Thanks for coming up with so many tasty recipes. Hi there! Such a huge fan of your recipes/blog in general. You’re an absolute champ. Quick question: is there something I can substitute for the GF bread crumbs? I am sensitive to all grains (so oats won’t work), but would LOVE to make this for Thanksgiving! Not sure if this would work but you could try pulsing some additional nuts? If I want to use a 9 by 13 pan how much more do you think I should increase the recipe? Would doubling it be too much? Hi Jennifer! I would probably double the recipe for a 9 x 13 pan, though we haven’t tried it ourselves. If you give it a try, let us know how it goes! I recommend pan roasting the mushrooms WITHOUT the addition of oil. The nutty flavor of mushrooms is released by dry roasting. They do not need oil to not stick to the pan. Heat them and JUST when you think they are going to start to stick, they release a ton of water into the pan and then turn brown and release all the nutty aromas hidden inside. Mushrooms should NOT be cooked in oil. Thanks for the tip, Nick. We are glad you enjoyed the recipe! I cooked it about twice as long to avoid it being mushy. I cut the loaf in portions and froze them. Reheating those portions for individual meals has worked out very well. I almost liked it better than right out of the oven. Love it! Made it last night and enjoyed every bite of it! 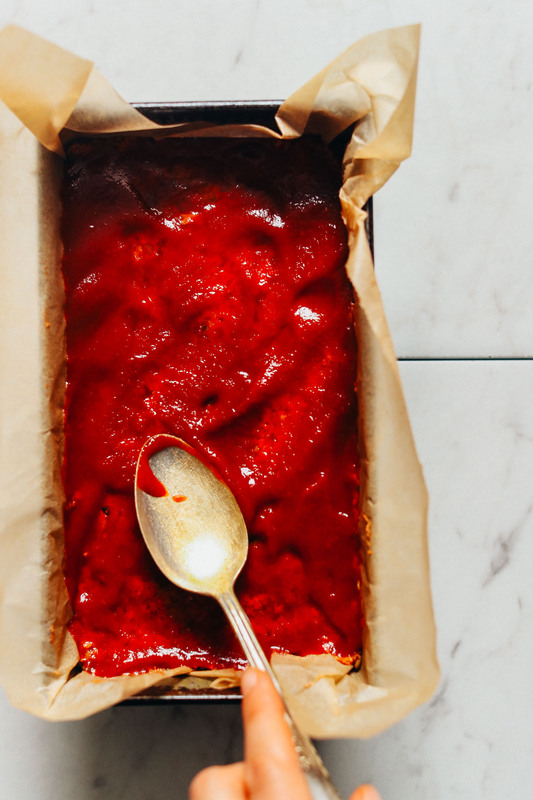 The only diff (simply because I wasn’t paying attention) is that instead of ketchup on top, I put tomato paste, and instead of tomato paste inside the loaf, I put ketchup … oops… still super delish! Made this vegan loaf last night and it was lovely. The only thing I would like to add would be onion and grated carrot as that is what I always put in my beef meat loaf before becoming vegan. Missed those flavors although this one was quite tasty. Do you think if I cut them very small. I could cook onion and carrot with the mushrooms? And if yes about how much to not overwhelm the flavors? Yes I think that would work well! I would add 1/2 cup of each and scale back the mushrooms by 1 cup. Let us know how it turns out. So I made this. Twice. It was even better than I thought it would be! My new Magimix turned everything into a puree but it looked and tasted exquisite! Even fooled some meat-loving guests who’d never have guessed it was totally plantbased. Made it again. This time subbing thyme with tarragon and chervil. Lovely as well! Will try it with the vegan gravy recipe next time. Thank you for all the greatness! This recipe is delicious!! Super easy to make and had wonderful flavor. I’ll be making it again soon. Yay! We are so glad you enjoyed it. Thanks for sharing! Can I prepare this ahead of time, refrigerate and bake 2 days later? I want to prepare food for Thanksgiving in advance. I made this last night and LOVE it!! Only change I made was that after pulsing in food processor a bit, I ended up mixing together in a bowl using my hands. That worked great and kept more texture. So yummy! And it looked great too! Great! Thanks for sharing, Marie! Made this for dinner tonight. It is yummy! I made this recipe and it was really delicious! My family loved it. I used baby bella mushrooms because thats what I had on hand and it was really good. The mushrooms and nuts were just delicious together with the lentils. It’s definitely a keeper. What a wonderful, flavorful, and aromatic recipe! My husband and children approve! I made this last night and unfortunately it wasn’t a winner for me. It smelled delightful and tasted good, but the texture was really off. I followed the recipe exactly (except for needing to cook lentils as I couldn’t find canned), but when it came time to pulse in the food processor, it quickly turned into a paste. It took a lot of processing to incorporate the large slices of potato, so maybe cutting them smaller would have helped, or pulsing those first? Despite a generous amount of bread crumbs and extra cooking time, I could not recover the mushy texture. For the amount of time and dishes used, I don’t think I’ll try it again, but maybe others will have better luck! Thank you for sharing all your wonderful, healthy recipes. This is my go-to site and I’ve had delicious success with almost everything else I’ve made! Wow – super delicious. What I love about your recipes is that they are bombproof even for challenged home cooks like me. This was a winner. I loved the mushroom flavors that really came through. I decided to do the BBQ sauce this time, but I’m going to make it again with the vegan gravy. It reheats well too. Thank you! Loved this recipe. I didn’t have any troubles as mentioned above. This freezes beautifully. I just ate my last reheated piece which means I need to make another batch. I wanted to start by saying that I’ve loved every recipe I made from the site and never had any issue. This recipe gave me some issues and I was hoping yall would be able to help troubleshoot. What I found was that the food processor (i have an eight cup) wasn’t able to handle all the ingredients well and I had to ultimately work in batches. Was I supposed to use two cups of the raw full nuts or two cups of the nut meal? I found that there was too much nut meal and it was difficult for all the ingredients to stick to the blades. P.S. Can i roast the sweet potato instead of cook them on the skillet. The loaf still tasted great but it was not easy to make. Hi Deborah! Just leave the mushrooms out or sub another vegetable you enjoy. I could even see roasted apples working nicely here! mmmmmm. Sounds delicious with the apples. Just takes a little imagination after all! Many thanks – yet again! I made this and while the flavor was there, it was mush, and mush that wouldn’t cook or firm up at all. I did add quite a lot more bread crumbs but no luck. But looking back canned lentils, al dente sateed sweet potato in a food processor equals mush. Love your recipes but I don’t think I’ll try this again. In all my time being vego this was the first time making a nut loaf , and I have to say it’s an absolutely wonderful recipe. I never liked meatloaf as a kid, but now that I get the chance to make my own, I love it. Beautiful texture and great flavours. Can’t wait to have leftovers in a sandwich with some ketchup! Classic comfort food at its best. Mine was a little sweet, so next time I’ll probably reduce the tomato paste and Worcestershire, maybe add in a little soy or miso instead, and a little garlic powder – and there will be a next time. Thanks for the recipe! I made this tonight but the loaf ended up being too wet on the inside and wouldn’t harden despite baking for awhile. I think draining the lentils extensively along with the mushrooms might help in the future along with lots more of breadcrumbs? I’m bummed because it looks good if done right. Ashley, did you use canned lentils or did you cook them from raw? I’m thinking canned are more mushy and that can result in a mushier loaf. Let me know! Question on the lentil loaf. Is there anything that can be substituted for the gluten-free crumbs? My daughter and I made this today. It was a huge hit. The taste was incredible. Our only comment would be that we would start the sweeet potatoes before the mushrooms as they took longer. Our family Loved this. Thanks so much. Any substitute suggestions for the tomato paste and ketchup? I’m allergic to nightshades, but would love to try. Hello! I’m wanting to make this for later on this week but I’m wondering if I can sub the nuts with cashews and walnuts versus pecans? Also, can I use cauliflower instead of mushrooms… or what other vegetables do you think would work well and taste great? Hmm, those changes will definitely change the flavor and texture. You can check comments above for mushroom and nut substitutions. Let us know if you give it a try! Tried this recipe yesterday for a Friendsgiving dinner and was excited because I haven’t had meatloaf in years since going vegetarian. Unfortunately the consistency was like mush and would not cook at all. Want to try again but any suggestions for making the texture a bit drier? Hi Carissa! Did you get a chance to watch the video to see what the texture should look like before baking? It should be like a veggie burger consistency before adding to the loaf pan. If it’s not, add more bread crumbs. And you can always bake longer if the inside isn’t cooked through. Hope that helps! Hi there! I’m making this tonight and am having trouble getting it to “set up” or cook through. Do you have any suggestions as to what I might be doing wrong? It smells delicious but it’s very soft in the middle. Hmm, it should be on the thicker side. Do you get a chance to watch the video to see what the texture should look like before baking? It should be like a veggie burger consistency before adding to the loaf pan. If it’s not, add more bread crumbs. And you can always bake longer if the inside isn’t cooked through. Hope that helps! What a gloriously flavorsome recipe! Despite it being so simple, the glaze looks marvelous. I love how hearty each slice appears! This was delicious and is better than my other go to Lentil Loaf. I served it with garlic rosemary mashed potatoes and green beans. My non-vegan husband ate it up too! The only issue I had was the loaf was a bit mushy. I cooked it a bit longer but it didn’t seem to firm up. I think next time I will add more bread crumbs. It had such a great flavor the mushy texture didn’t matter. This is a keeper, thank you!!! Yeah! More bread crumbs will do the trick. Glad you enjoyed it! Mine turned out mushy too! I did put exactly 1/2 cup of breadcrumbs in so I don’t know what went wrong. Anyway, the taste is great. So depending on what bread crumbs you use, and whether you opted for fresh cooked or canned lentils, the moisture level will be affected. If you used canned lentils you’ll almost certainly have a wetter texture. You can compensate this with extra bread crumbs! I made this today. It is the very best lentil loaf I have ever made and I have gone through many, many recipes. This one is a keeper. Followed the recipe without any change. Will be making this for Thanksgiving for myself and other vegan/vegetarian guests. Thanks!!! thanks, Karan! So glad you enjoyed it! Yum!!! I’m making this for thanksgiving and your easy vegan gravy plus the vegan biscuits as that is my husbands favorite! Thank you for all the great meal ideas! Hi – this looks delicious! I am allergic to both pecans and walnuts, but other tree nuts I am okay with and love. I saw the substitution suggestion for pepitas and sunflower seeds in the comments, but do you have a nut substitution that you might suggest? So, what about cashews? Otherwise I’d suggest a blend of seeds, maybe flax, cashew, sunflower, pumpkin, and even oats if you can! I made it with cashews and almonds. Amazing! Chestnuts are a great addition to a nutloaf! What is the texture like? I have a bunch of carnivore kids I’m trying to convert. It’s very hearty, like meatloaf! Ha! This recipe was tested several times before finalizing as it was a little trickier to get the color, texture, and flavor right. We try and salvage all of the other (failed) attempts and use them in other meals. I can only imagine eating 2, 3, 4 or more lentil loafs in short order (or any other recipe you test several times)! 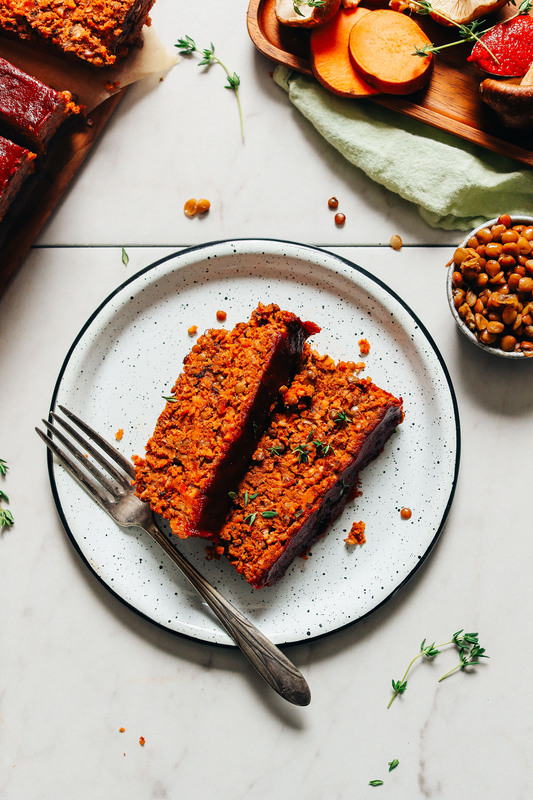 Lentil loaf for breakfast, lunch and dinner! :) Luckily, I’m sure they’re all delicious. I’m not as experienced in cooking so forgive me if this is a silly question but could I add vital wheat gluten instead of breadcrumbs if I wants a meatier texture? Disregard the other comment, I accidentally left the wrong email address. Oh, I think so! I haven’t used that ingredient but have heard it works wonders. Hmm, interesting. Thanks for the advice. Just to confirm, your walnuts were fresh (not rancid), and they were raw (not toasted)? Or Black walnuts they are much stronger. OMG. I made this tonight and it was absolutely amazing. I kept everything the same and it was perfect. Total comfort food!! Same here! Ah-mazing!!!! You’re a genius Dana! I just came across your blog and I’m IN LOVE!! I have been trying out all the recipes and I’m very excited to try this for my Thanksgiving dinner! However, I am wondering if you could give me a substitution for mushrooms? I really really dislike them. Also, I am allergic to walnuts, do you have another option for them as well? Hi Claudia! Check the above comments for some ideas! Love all of your recipes, can’t wait to try this one! I’m making this for Thanksgiving and was wondering if I could prepare ahead of time and then not bake until the day of. That should be ok, right? Maybe I could put it all together a day or two before, throw the loaf pan in the refrigerator and bake the day of!? Oh yeah, that’ll be fine! Hope you love it, Rochelle! Just in time for Thanksgiving Dana, thank you. I’ve been searching all week for a delicious vegan loaf to make. Love the mushrooms in it and it’s a beautiful color. Can’t wait to make, your recipes are always easy and Delicious. Me too! All nightshades. Would love a good substitution. The tomato paste adds a little moisture and some rich flavor. I think you could substitute with any vegetable puree, such as pureed pumpkin. Most simply, you could leave it out and increase the vegetable broth or water for texture. I made this and loved the flavor, however it was incredibly mushy. This was my first time making a vegan meatloaf so I’m wandering where I may have gone wrong. Any tips? I’m thinking maybe I spun it in the food processor too long. I also made a roasted pepper glaze to top it with and it was wonderful. Overall it was a great dish with fantastic flavor. I just need to figure out why it was so mushy so next time I can prevent it from happening. Our best guess is that it was pulsed too long in the food processor. Hope that helps! Do you have any suggestions for mushroom substitutions? I have a family full of people that don’t like mushrooms. I was hoping to make this the day before Thanksgiving. My plan is to leave it in the loaf pan and then reaheat it in the oven. Do you think this will work, or will it end up drying out after being in the oven twice? So, I would recommend just one bake if possible! Do you think it would be ok to get it all together in the loaf pan, then freeze, then bake day of? I love your recipes! I am excited to try this one. I dont eat Mushrooms. Can you please suggest a replacement? See the above comments! Should be some helpful substitutions. Good luck! I would definitely like to make this for Thanksgiving but I try to prep as much before hand as possible. Do you think I go do all the assembly the day before and bake the day of? I love everything you make! But I’m not a fan of mushrooms. Do you think this will work without the mushrooms or should it be kept as is? Thanks! See the above comments! Either leave them out or replace with your favorite vegetable or even baked apples. Good luck! Yes, I want to make this recipe too but I don’t like mushrooms as well. Dana, you said to replace with favourite vegetable. Are there any vegetables you recommend that would work well with this recipe? This sounds delicious!! I’m excited to try this out. My fiance is not the biggest fan of sweet potatoes (probably the only food he doesn’t like! ), do you have a recommendation of something to replace those with? Thank you, and happy Thanksgiving!! Regular potatoes should do great! I just made a vegetarian chili with parsnips and I really enjoyed the flavor it added. You might want to try parsnips instead of the sweet potatoes. If you do, I’d love yo know how it went. I would have to omit the nuts as my daughter has a severe nut allergy. What can I substitute it with? That’s easy! Try a combo of sunflower seeds and pepitas (pumpkin seeds)! How about pumkin seeds instead of the nuts as long as they are manufactured in a nut free location. Thanks for the help, friends! I think those are great recommendations. Several brands make vegan Worcestershire, such as Edward & Son’s and Annies, hence why she specified “vegan Worcestershire” in the recipe. Thanks for the reply, Carie! Yes, Amy, you have to get vegan Worcestershire (and ensure gluten-free friendly when needed). But there are several brands available! The Wizards and Annie’s are a great place to start. If you can’t find those brands, feel free to sub something similar, such as A1 sauce, tamari, or coconut aminos. Whole Foods also sells a vegan Worcestershire sauce which is generally much cheaper than other ‘fancy’ brands. I just took a look at my bottle–it isn’t labeled ‘gluten free,’ but I didn’t see anything in the ingredients that would contain gluten. I use it in the loaf recipe I make each year for Thanksgiving. You might want to add about a teaspoon (or a bit more) to the ketchup topping to give a slightly different flavor. There are vegan versions of Worcestershire sauce, that’s why the ingredients lists mentions to get a vegan version. I make my own because I do not eat onions or garlic. Here are some tips. Seaweed (Kombu, Nori, Hijiki, Dulse, or Wakame) + Tamari + Capers Brine will offer exactly the salty, fishy, briny umami flavor profile ground anchovies bring to any recipe. I don’t like the crumbs, that I can buy. What would be a good substitute? Do you think oat flakes would work? I’d recommend pulsing day old gluten-free bread or, better yet, your favorite gluten-free cracker in a food processor into a fine meal! Also, you can always order gluten-free bread crumbs on Amazon. I just linked them in the instructions. Good luck! If subbing dried thyme for fresh do I decrease the amount? Nah, I’d leave it the same! looks amazing — we don’t eat mushrooms (none of us can stand the texture or smell in our family)- is that essential? could i just leave them out? cheers! always on the lookout for something for the holidays that is easy – – looks amazing. I might just up the lentils perhaps? Additionally, where we live there are no gluten-free breadcrumbs – can you just make them? (I’ve never tried – and my son recently needs to be gluten free)? just blitz some gluten free bread in a blender or food processor…. I also do not like mushrooms so it would be great to know what they can be replaced with or how they can be left out. Not essential! Just leave the mushrooms out or sub another vegetable you enjoy. I could even see roasted apples working nicely here! As for gluten-free bread crumbs, I’d recommend pulsing day old gluten-free bread or, better yet, your favorite gluten-free cracker in a food processor into a fine meal! Also, you can always order gluten-free bread crumbs on Amazon. I just linked them in the instructions. Good luck! Ha! We were typing at the same time. Thanks for the response. I will substitute carrots for the mushrooms. Roasted apples sounds really good! Such a joy to find out so many people DON’T like mushrooms! I think they’re lauded (by meat-eaters?) for their meaty/umami-like properties, but truly, they’ve got nothing on nuts, legumes, and vegetables. Lol, in fact mushrooms are kinda gross and this 45-year vegetarian will never build a meal around them. I am looking forward to trying this recipie. Funny enough, I’m a mushroom farmer who is allergic to mushrooms so I’m excited by some of he other options. I’m thinking eggplant would be a nice substitute as well. As for the comment about mushrooms not being vegan because they’re grown in poop, only the classics (whites, browns and ports) are. Shiitake, oysters, Lion’s mane (which has a totally meaty texture with a very mild flavour) and many other specialty mushrooms are grown off of hardwood. I’m not a fan of mushrooms either, but I went ahead and used them for the recipe and once they have been cooked and added to the food processor you can’t even tell they are there! Promise!! I loved everything about this recipe! Hmm, I’m not sure! I’ve never worked with that product. But if you give it a try let us know how it goes!